Today the role of the private sector in reducing the impact of disasters is more important than ever. In an increasingly inter-connected world, staff, supplies and logistics are impacted on a global scale whenever disaster strikes. The need for the private sector to invest in improving preparedness and response to emergencies is therefore not only a humanitarian imperative but also a business necessity. As climate change is reducing the resilience of the most vulnerable communities in the world, more of the global population is experiencing humanitarian emergencies with increasing frequency. 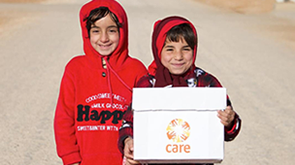 In emergencies, CARE responds to save lives, addressing Sustainable Development Goals SDG 11 –sustainable cities and communities, and SDG 13 – climate change.